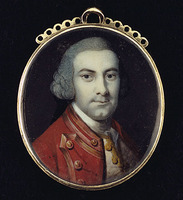 EYRE (Eyres, Ayres), WILLIAM, army officer, engineer; d. 1765. Nothing is known of the early life of William Eyre except that he had considerable military experience in Europe before coming to North America. A practitioner engineer in 1744, Eyre fought in Scotland with the government forces against the Jacobite uprising of 1745. In 1747 he worked as engineer in ordinary defending Bergen op Zoom, Netherlands, and the next year was ranked as sub-engineer. Eyre came to Virginia with Major-General Edward Braddock early in 1755 as captain in the 44th regiment, but was posted to the colony of New York before Braddock launched his ill-fated expedition against Fort Duquesne (Pittsburgh, Pa.). That same year Eyre acted as engineer and quartermaster in William Johnson*’s march against Fort Saint-Frédéric (Crown Point, N.Y.). He built palisaded Fort Edward (N.Y.), then joined Johnson’s main force in time to fortify a campsite at the head of Lake George (Lac Saint-Sacrement) before General Dieskau’s forces attacked. 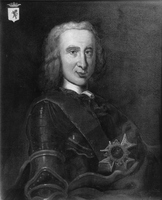 Eyre’s success in commanding the artillery in the ensuing battle won commendation from his superior, thanks from colonial governments, and a promotion to major. 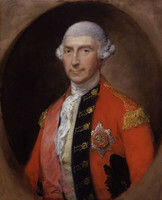 His professional influence upon colonial officers can be seen in his instructions to commandants of his forts. These were introductions to siege warfare and descriptions of the “honours of war” which the officer was to insist upon if he were defeated. Eyre was commissioned lieutenant-colonel 17 July 1758, nine days after he had been wounded while commanding the 44th at Fort Carillon (Ticonderoga, N.Y.). A year later he was made acting chief engineer and began building the new Fort Ticonderoga. General Jeffery Amherst* ordered Eyre to Fort Niagara (near Youngstown, N.Y.) that autumn “as I thought it the best thing I could do, for effectually securing that place.” In the summer of 1760 Eyre rejoined Amherst’s force in time to help with the taking of Fort Lévis (east of Prescott, Ont.) 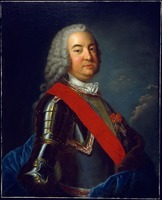 and the march on Montreal, where he spent the winter. 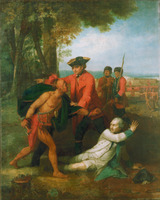 As the military focus shifted westward, Eyre returned to Fort Niagara in July 1761, where he participated in a conference with Wabbicommicot and some other Mississaugas. The winter of 1761–62 he surveyed the flood damage at Fort Pitt, which had been built on the site of Fort Duquesne. As he was about to go to Niagara again in the fall of 1763, Eyre confessed “I am tired of the War in this Country.” Even with eight years of continuous service, he could not obtain leave. It was finally granted in the autumn of 1764, but Eyre was drowned near the English coast on his way home in 1765. For all his European professionalism, Eyre was not oblivious to the realities of the frontier. One of the few British officers to criticize Amherst’s Indian policy, Eyre described it as “Chastize them if they misbehave,” an approach “so obviously Romantic and Contrary to common Reason.” Eyre suggested withdrawal from the posts west of Niagara to reduce provocation, to enable the remaining posts to give one another better support in emergencies, and to weaken such Indian attacks as did occur by lengthening their routes. He argued that small trading parties, led by men bonded to trade fairly, would deal more equitably with the Indians than the forts did, and that any harm done to traders could be countered by an embargo against the offending tribe. Yet Eyre’s real contribution was as a part of that military professionalism which triumphed in both contending armies, and then in the contest for Canada itself. PRO, WO 34/76, 34/85. Correspondence of William Shirley (Lincoln). Johnson papers (Sullivan et al.). Knox, Historical journal (Doughty). Military affairs in North America, 1748–1765: selected documents from the Cumberland papers in Windsor Castle, ed. S. M. Pargellis (New York, London, 1936). NYCD (O’Callaghan and Fernow), X.
I. K. Steele, “EYRE, WILLIAM,” in Dictionary of Canadian Biography, vol. 3, University of Toronto/Université Laval, 2003–, accessed April 19, 2019, http://www.biographi.ca/en/bio/eyre_william_3E.html.